A whisky with a delicate well-balanced character. This subtle blend of malt whisky is matured in bourbon casks and then seasoned with a special combination of large and small casks: rich sherry and new Swedish oak. Light and approachable with lemon sherbet flavours and a fresh finish. 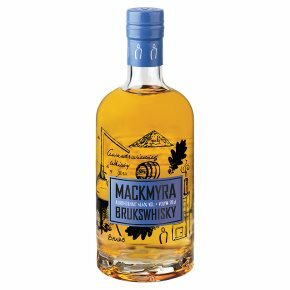 From our distillery in Mackmyra Bruk in Sweden comes a new, well-balanced, light and fruity character: Mackmyra Brukswhisky, aka The Swedish Whisky. Created to be enjoyed, on any occasion. Mackmyra Brukswhisky is made from our soft elegant recipe matured in bourbon casks. We then spiced it up with a special combination of large and small casks: rich sherry and a touch of our fresh Swedish oak. For a light hint of juniper smoke, we added some of our smoky variety.